. . . and another new tradition for me . . . mincemeat! Two kinds - one with meat, real meaty meat and one without, like we know it now-a-days. Looking at the picture above, the one with minced beef is on the right, I was surprised how light coloured it is, especially in comparison with the very dark non-meat mixture on the left. I am yet to find out how either tastes ; but I am dying to know if I can tell the difference and if the real-meat mincemeat is less sweet and sickly as Hugh promises. I will let you know! But if the meat mincemeat pies are not to our taste the mixture apparently make a wonderful stuffing for pork. Either way I win! I haven't made very much because I only wanted a little, so multiply to your requirements. Sterilise some jars before making these mincemeats by preheating the oven to 120°C and heating some clean jars and their lids for an hour. Once the jars are filled they will keep a while but can be used after a week or so. Turn the jars the other way up every so often to allow the liquid to permeate. Mix everything together thoroughly and store in the sterilised jars for a week or so before using to make mince pies (or to stuff pork!). 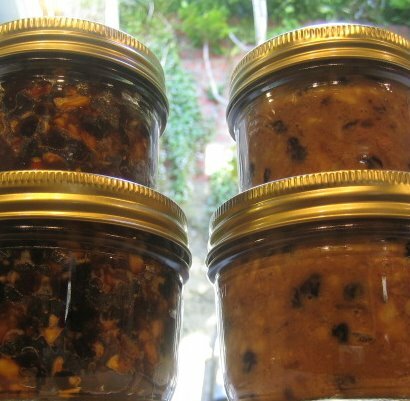 Mix everything together thoroughly and store in the sterilised jars for a week or so before using to make mince pies. Check Morsels and Musings for other Festive Food Fair fare. Glad you found it, there were a few meaty/bloody bits in mine too but I just picked it out - not so bad! Ha! Let me know how it goes! wow, it's going to be interesting to hear your verdict on what the real mince meat pies will taste like. I'm looking forward to your reporting back on how the meat mincemeat tastes. My Christmas preparations are way behind!